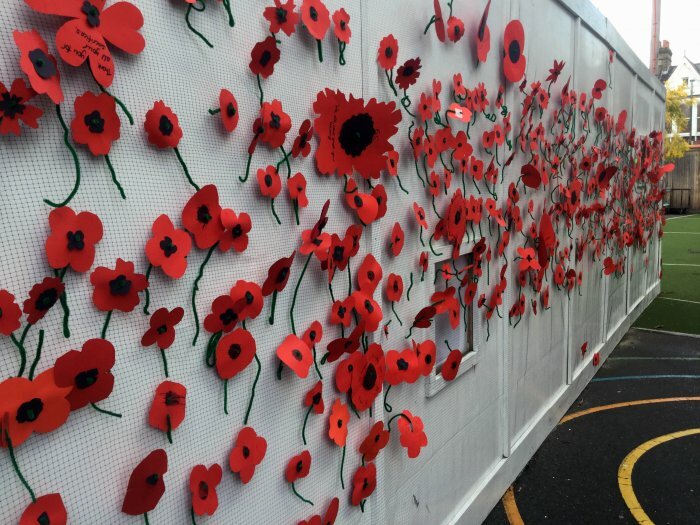 Hornsby House pupils have made a wall of poppies, which went on display in the school playground to mark 100 years since the end of World War I. 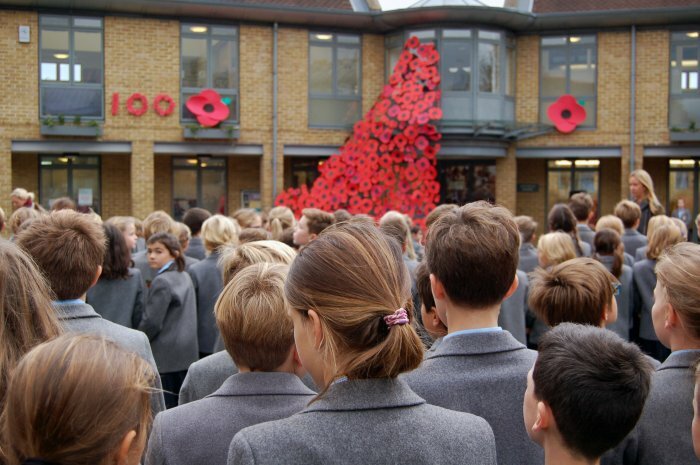 Each pupil made their own poppy and attached it to the wall, making an eye-catching display which evoked the scale of loss of life in the war. The event formed part of an extended Remembrance week to commemorate the centenary, which included an external drama company delivering workshops that brought war poems to life. Year 6 pupils have been selling poppies to the school community at morning drop-off and afternoon pick-up times to raise money for the Royal British Legion. The whole school congregated in the playground for a special centenary edition of the annual Remembrance service, led by Headmaster Ed Rees. The poignant service included readings by Year 6 pupils and the brass ensemble played The Last Post. Each year Hornsby House take their Year 5 pupils to Ypres in Belgium, on a 4 day trip visiting the battlefields and war graves in the area. Parents and pupils were encouraged to research their family history in relation to the war over half term and have been sharing their discoveries in class this week. 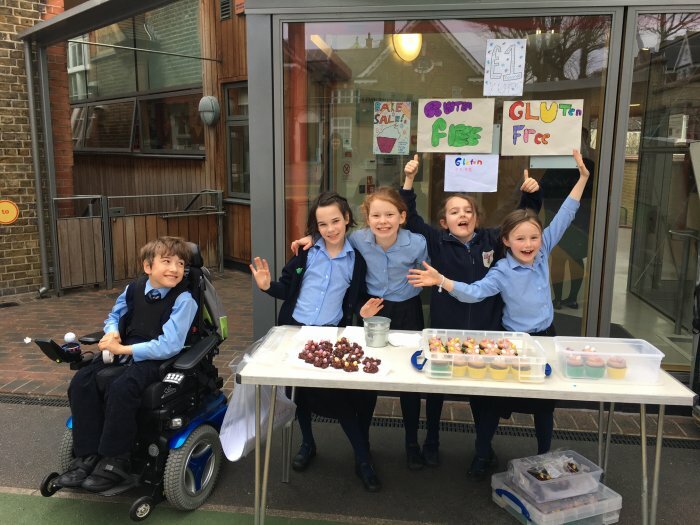 Hornsby House have been raising money and collecting donations for the Little Village charity, which has its headquarters a few streets away from the school. Little Village provides good quality baby clothes and equipment to families who need it. All the clothes and equipment are donated by local families and the charity is run by parents as an entirely voluntary enterprise. The charity offers a weekly drop-in service for families who need support, a delivery service and also provides a referrals-based service for health visitors, children’s centres, midwives and the local foodbanks. Families can either bring a voucher and select items from the Little Village stockroom themselves, or volunteers can put together bags of kit for them. The bags are designed to feel like gifts, rather than hand-outs, so goodies for the mum are included, and only good quality items are passed on. The Balham centre has been such a success that Little Village have now opened a second centre in Camden. Hornsby House has collected donations of baby and toddler clothes, books, games and equipment, as well as raising £1,374 from sales of cakes and wristbands and a concert by all the school choirs. The children then brought in gifts from home to give to the Little Village mums for Mothers’ Day. Alongside these activities, the Hornsby House School Parent Teacher Association has run a series of events in aid of Little Village, including a ceilidh evening and a quiz night for parents, as well as a toy fair and disco for the children – these have raised £4,000, bringing the grand total to well over £5,000. Each of the three Year 6 classes have also visited the Little Village headquarters to help process donations. They sorted books, checked games and puzzles were complete and in working order, cleaned buggies and created artwork to brighten up the storage room. 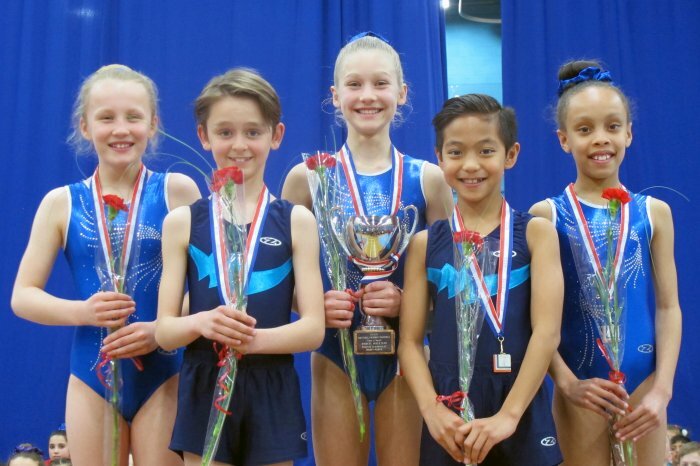 The Hornsby House School gymnastics team has won the National U11 Mixed Team title at the British Schools Gymnastics Association (BSGA) Floor and Vault Finals, which took place in Stoke-on-Trent on 30th April. It is the second time in three years that the school has won this competition and Hornsby House pupils Nicolas Goad and Phoebe Hastings also took the individual honours for the highest scoring boy and girl. The team’s success at the BSGA Floor and Vault Finals follows their third successive win at the BSGA Milano Team Trio Finals which took place in March, also in Stoke-on-Trent. The pupils are very proud of their medals and the silver cup and shield that they were awarded as winners of these two events. The cup and shield will be engraved and displayed at the school for the coming year. 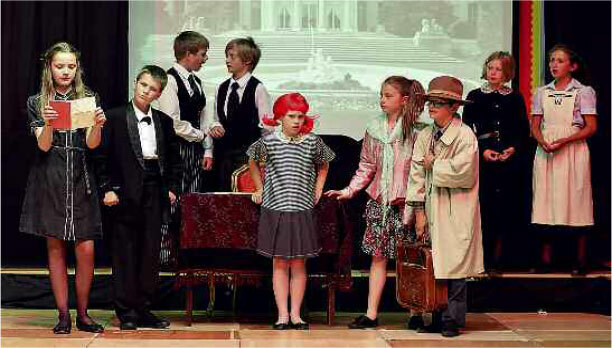 Arts Council England has awarded Artsmark Gold status to HORNSBY HOUSE SCHOOL. This award is only held by 6% of schools nationally and it recognises the variety and quality of the arts opportunities that Hornsby House offers its pupils throughout the age range. In order to achieve Artsmark Gold, the school carried out a comprehensive application process and was then visited by a professional arts consultant, who commented, "as soon as you walk in to the school entrance the creativity is immediately apparent" and noted that,"there is great clarity and vision for how the arts are managed creatively, why they are included and why they are an important entitlement for all students." 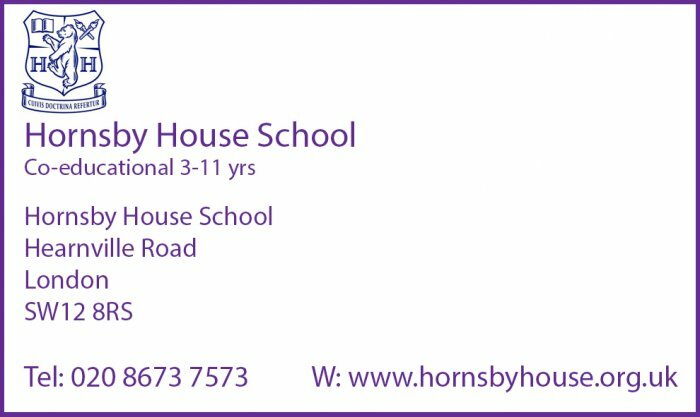 Hornsby House has a generous staff:pupil ratio and there are specialist staff who lead the provision of art, design, music, drama, dance and gymnastics in the school. They also arrange for every class to visit a current exhibition or national collection as well as to see a live drama performance during the year. All staff work together to integrate arts across the curriculum, organising activities such as themed history days which include art and drama. 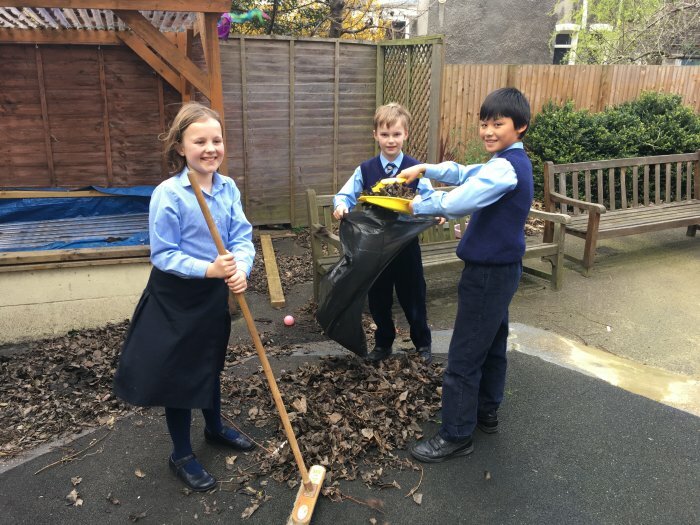 In addition, there is a wide range of after school clubs for the children, a significant proportion of which have an arts focus, and these allow the children further opportunities to develop their interests. Mark Peters, Assistant Head, led the Hornsby House team who put together the Artsmark application. He said, "We are very proud of being awarded Artsmark Gold in recognition of the high standard of our arts provision and I would like to thank all of our specialist arts teachers for their outstanding work and commitment." 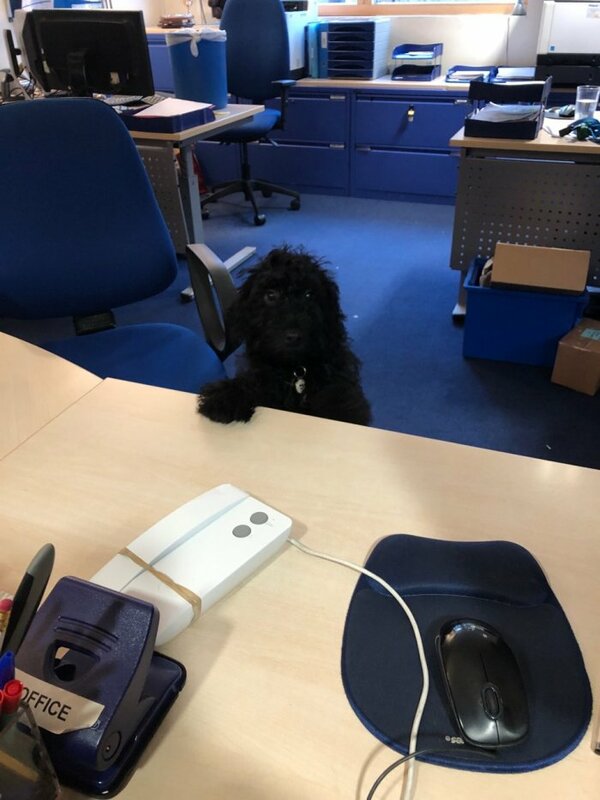 Hornsby House School have welcomed their latest addition with the arrival of Digby, the Headmaster Ed Rees’s new family dog. Digby is enjoying exploring his new surroundings and has met all the pupils at the school, who already adore him. Ed Rees told us, “We are so pleased that Digby has settled in well. In introducing him to the school, it was always my intention for him to add value to the wider school community by bringing a smile to the children’s faces and providing comfort to those who might be having a difficult time. Our plan is for Digby to complete his training as a therapy dog and become an invaluable member of the school”. Digby is a labradoodle, who are well known for their calm demeanour and sensitivity around children. 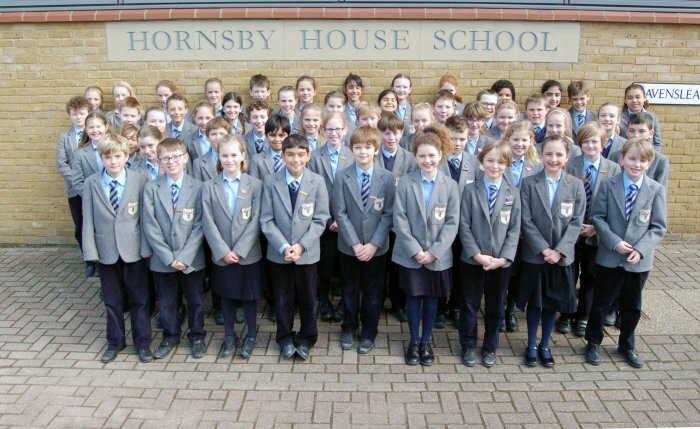 Year 6 at Hornsby House School have achieved another outstanding set of results in their secondary school entrance exams. A record 44% of the children in the year group were offered a total of 49 awards, including 34 academic scholarships, two art awards, three for drama and ten for sport. Numbers of offers from the most competitive schools were impressive, with 17 from Alleyn’s, 20 from Whitgift, 9 from James Allen’s Girls’ School (JAGS) and 7 from Dulwich College, while acceptances were spread over a wider range. Alleyn’s, Whitgift and Streatham & Clapham High School are the top three destinations and account for half the year group. Four children are going to each of JAGS, Trinity, Wimbledon High School and Woldingham. A variety of destinations make up the remainder, including Dulwich College, Emanuel and King’s College School Wimbledon, as well as boarding schools, such as Dunhurst and Ardingly. In their most recent inspection in October 2016, the Independent Schools Inspectorate judged Hornsby House as excellent, both in the quality of pupils’ academic and other achievements and in the quality of pupils’ personal development. The report also noted that, “the school works closely with parents to prepare pupils for senior school entrance examinations and the demands of secondary education”. This is reflected in 50% of the year group accepting places at secondary schools which feature in the Times top 50 independent schools 2018. 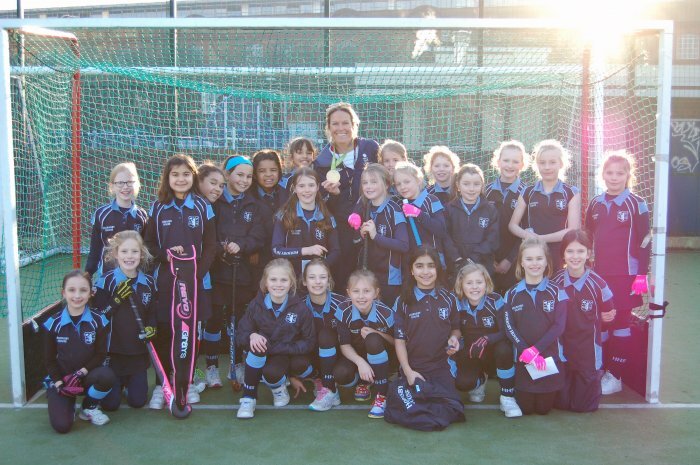 The Year 5 girls at Hornsby House School were lucky enough to have a visit from Crista Cullen, Great Britain and England hockey player. Crista is widely regarded as one of the best defenders in the world and has over 185 caps for the GB and England teams, winning a bronze medal at the 2012 Olympics in London, followed by a gold medal at the Rio Olympics last year. She carried out a training session with the girls, passing on lots of techniques and tips for improving their game. They were amazed by her skill and delighted that she brought along her medals to show them. It was an inspirational and memorable afternoon. The children at Hornsby House School had a lovely surprise when they arrived at school today for the last day of term. They were greeted by Father Christmas in his sleigh, along with his elves and three reindeer. 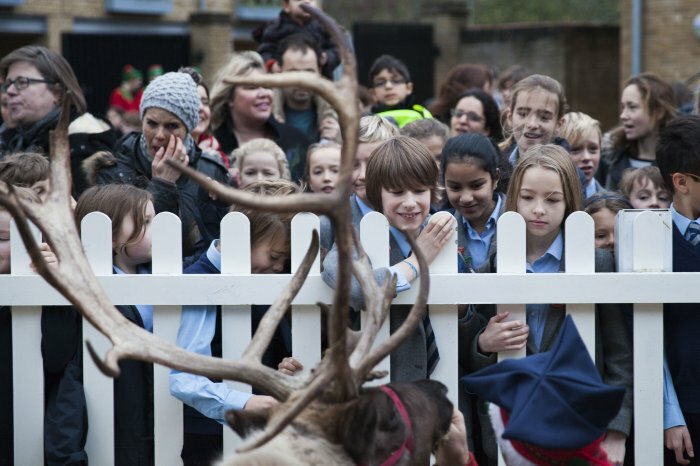 Children, parents and staff sang carols together in the playground and were able to stroke and feed the reindeer – it was a memorable start to the Christmas holidays. The children from the three Reception classes had an extra special treat. After the rest of the school had gone into their classrooms, Father Christmas gave each Reception child a present and they all had a turn at sitting in the sleigh. 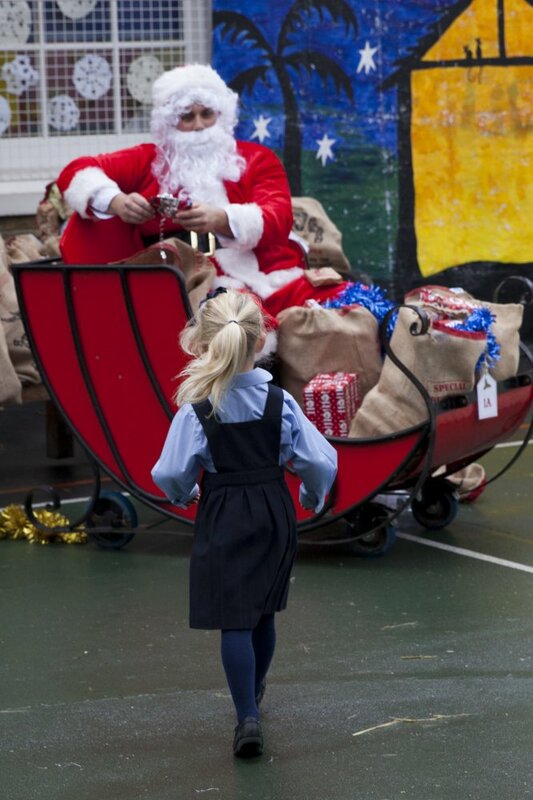 Father Christmas then toured the rest of the school, delivering a sack of presents to each class. Woldingham School, Surrey, welcomed seven prep school choirs, including over 200 children, on 10th October to its Junior Choir Festival. Woldingham’s music teachers took the pupils through a carousel of musical sessions to develop voice, rhythm and performance skills. The children were enthusiastic participants, bubbling through water in unison, humming as though at a Formula 1 race and responding to each other through clapping. 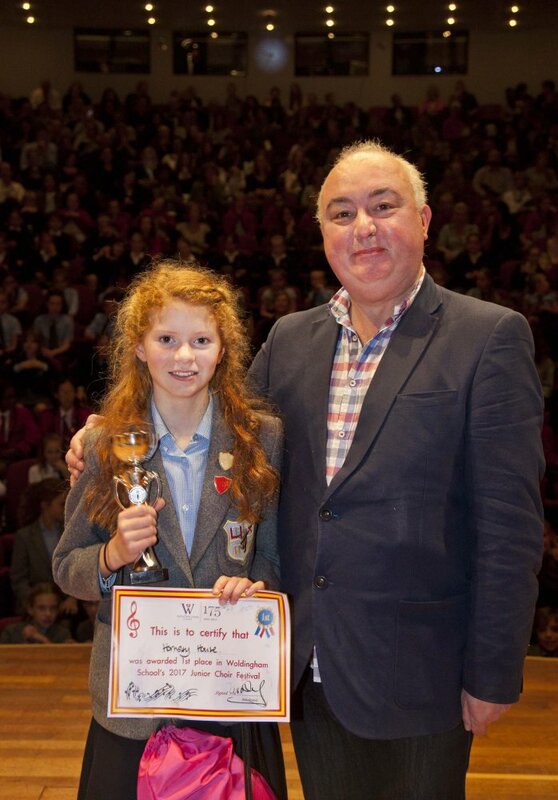 Each school was supported by some of Woldingham’s music scholars. The event culminated in a performance to parents, schools and Woldingham’s teachers. The 600-seat auditorium was packed and the choirs sang impeccably to rapturous applause. After performing their individual pieces, the choirs came together to sing a beautiful rendition of O Taste and See by Vaughan Williams. Adjudicator Ian Belsey, who has spent over forty years in show business and is one of the world’s leading performers in light opera, selected Hornsby House’s Chamber Choir as this year’s winners. Their performance of Coldplay’s Fix You was chosen for its beautiful tone and control. 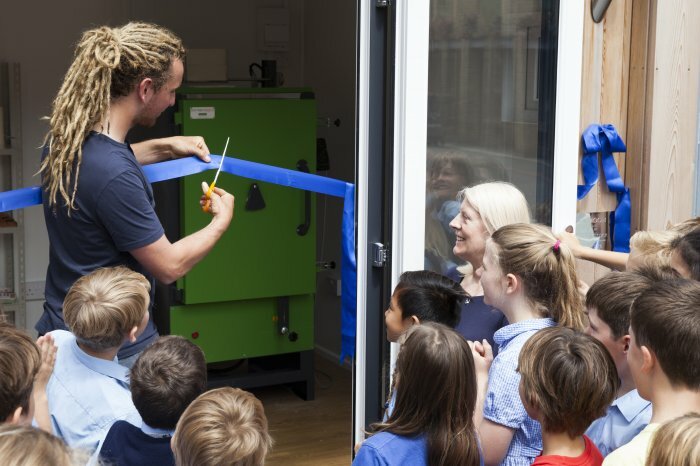 Matthew Wilcock, winner of the popular 2015 BBC series The Great Pottery Throw Down, came to Hornsby House School in Balham to open the new kiln room. Pupils from Years 4 and 5 watched the official opening and gave Matthew a huge cheer as he cut the ribbon. 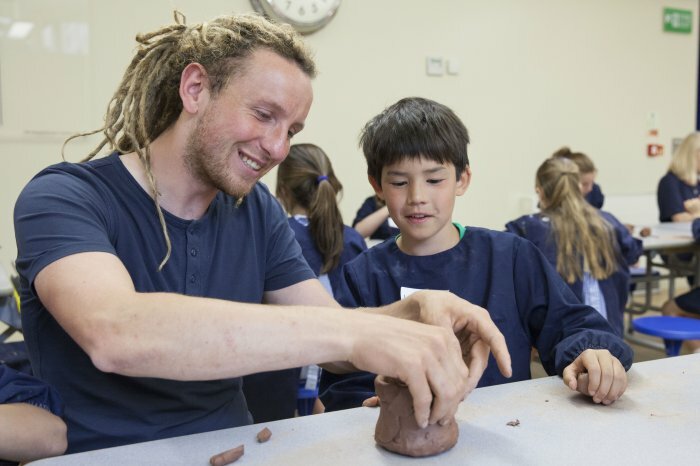 Matthew also ran an exciting pottery workshop with 20 pupils from Year 5. The children loved working with him and he shared many techniques and interesting ideas. Matthew is Resident Potter at Giggleswick School in Yorkshire and balances teaching responsibilities with producing his own work. His passion for ceramics came from his parents and his greatest inspiration has been his father, Geoff Wilcock, who has worked as a ceramics teacher and technician for over 40 years. Pottery will now feature in the art curriculum for all Key Stage 2 pupils from September and there will be an after school club for children who are keen to do more. Hornsby House will also offer access to the new kiln to some local primary schools which do not have their own firing facilities. 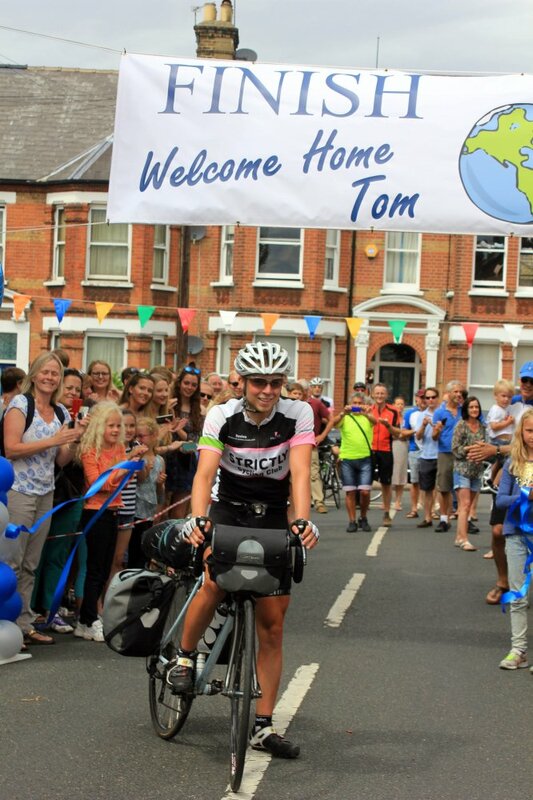 19 year old Tom Davies cycled solo around the world during his gap year and arrived back home in August. He was welcomed back by a group of family and friends, including parents and children from Hornsby House School, where he was a pupil and worked as a gap year assistant during the autumn term ahead of his big trip. Tom is now starting a degree at Loughborough University but found time to come back to Hornsby House beforehand to talk to the children about his incredible journey and the many challenges he faced along the way. The children were inspired and amazed by Tom’s talk and the wonderful photographs he showed. 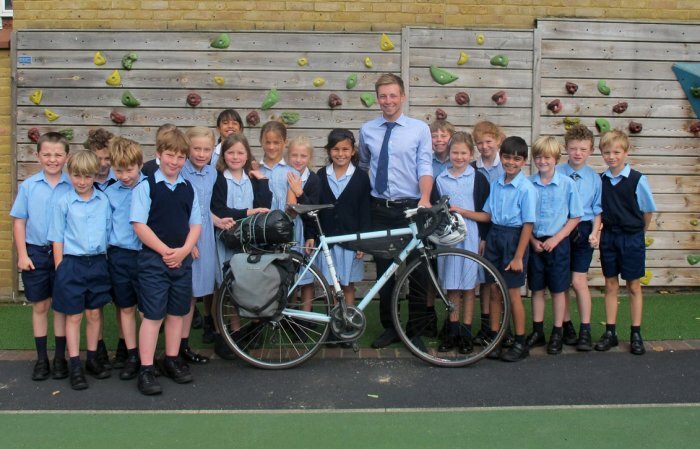 Tom set off from his home in Battersea in January and cycled over 18,000 miles across Europe, Asia, Australasia and North America. Although this is not an official Guinness World Record, since “youngest” records are not recognised, Tom believes he is the youngest person to have done it. He also made sure he fulfilled all the key criteria for a round the world trip, such as using the same bike frame throughout, starting and finishing at the same point, riding in one direction, covering at least 18,000 miles and passing through two antipodal points – in his case, Wellington in New Zealand and just north of Madrid in Spain. The trip was an enormous personal challenge and, although he received much kindness and hospitality from many different people around the world, he needed to be almost entirely self-reliant. He had many adventures along the way, including being held up by snow in Greece, being chased by dogs in Albania, and crossing the Nullarbor Desert in Australia, but did not let anything deter him. Tom raised money for three very worthy charities: Sohana Research Fund, Prostate Cancer UK, and Carney’s Community. Sohana Research Fund is focused on funding research to find a cure for Recessive Dystrophic Epidermolysis Bullosa, a genetic skin blistering condition, while Carney’s Community is a small charity that works to turn around the lives of disadvantaged and excluded young people. To date, Tom has raised over £57,000, which will be shared between the three charities.